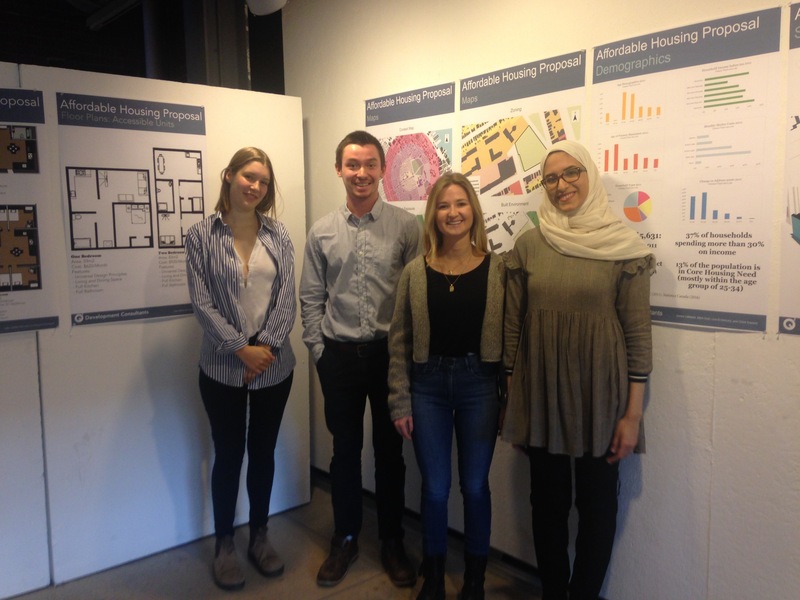 At the Dalhousie School of Planning, students in our Bachelor of Community Design have two chances to work on a project with a client in their final year. In fall, they choose either urban design or environmental planning studio, and in winter they work as a group on another planning project. This fall, I’m teaching the studio in urban design. As my expertise is in housing and transportation planning, I sought a client that would be interested in a project in one of these areas. 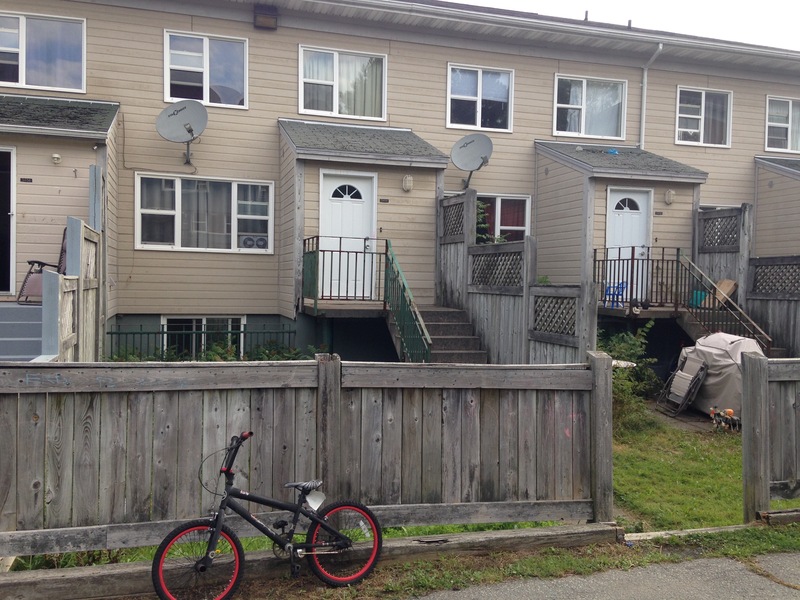 Like many cities, Halifax is facing some serious housing affordability issues. 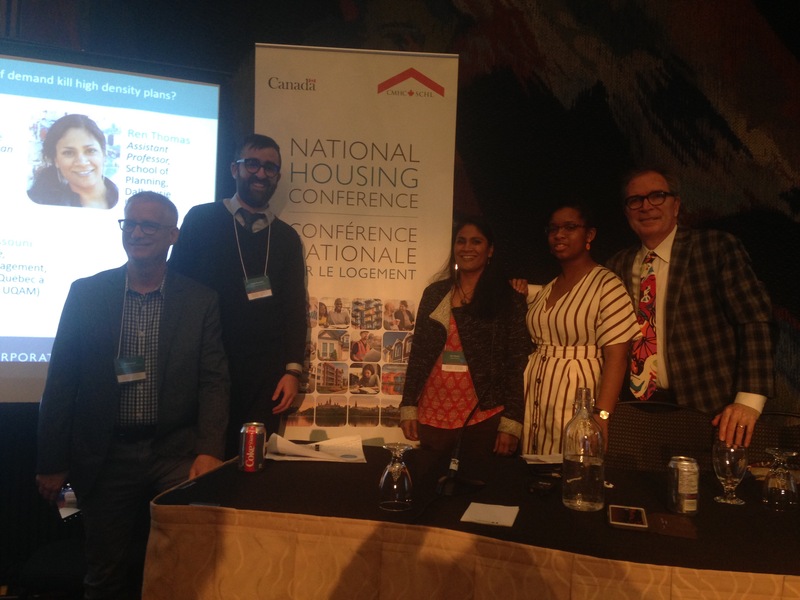 Three years ago the Halifax Regional Municipality partnered with CMHC, United Way, and several public health authorities on a Housing and Homelessness Partnership which has already released a Housing Needs Assessment outlining some key areas the region needs to focus on: more rental housing, housing for smaller households, and a focus on those with incomes in the bottom five deciles. Our client, the Mulgrave Park Caring and Learning Centre, illustrates some of these challenges. 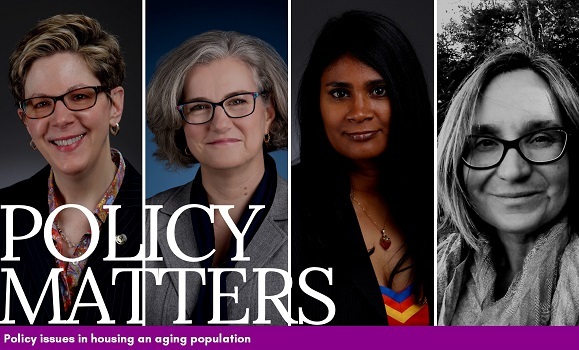 As a non-profit organization developed by community members, they are filling in the gaps of service provision in a neighbourhood developed in a complicated era. Mulgrave Park is one of Canada’s first public housing communities. Built through the now-controversial urban renewal process in the 1950s and 1960s which involved demolishing existing “slum” housing and rehousing tenants elsewhere, Mulgrave Park was designed by CMHC architects in 1959 to take in those displaced in other downtown neighbourhoods through the Central Area Redevelopment Plan. The community is tight-knit, with the average household living there between 5-10 years and several returning residents. 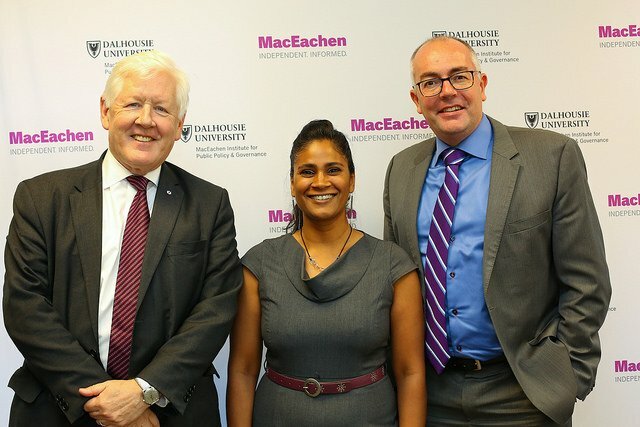 Two of those who grew up in the community and returned to help improve it are Crystal John, Director of the Caring and Learning Centre, and Maurice James, Coordinator of the Phoenix Youth and Community Centre. 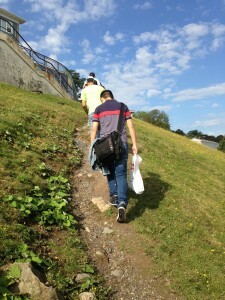 Another initiative in the community is Progress in the Park. 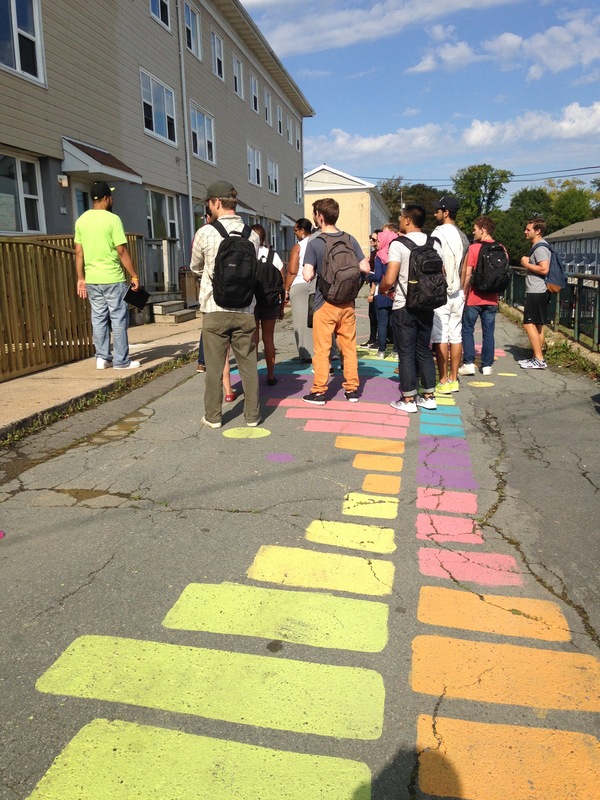 Jurisdictional issues aside, municipal councillor Jennifer Watts has also been a critical advocate for the community, helping them build a community garden and hold a community-building event involving street painting. In the quintessential Modernist style, the community has huge concrete retaining walls to deal with the steep slopes down to the waterfront, very little private space for tenants, no community services, and minimal space for social activities or playground spaces. As in other public housing communities, the maintenance of the community (open spaces and the buildings themselves) has been left to an often cash-strapped Provincial government, who oversees the Metropolitan Regional Housing Authority. Like many areas of the city (e.g. parts of the waterfront owned by the federal government), jurisdictional issues have complicated the maintenance of the community, any proposed changes, and daily issues such as how tenants’ concerns are addressed. Due to operating agreements between CMHC and the Province, Mulgrave Park residents are left without many of the basic services that other Halifax residents take for granted–for example, until recently there was no playground for children, or a spot for residents to garden. 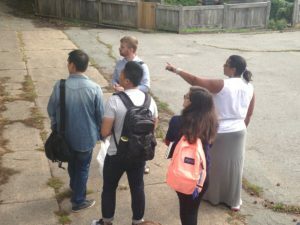 The Housing Authority allowed the Caring and Learning Centre and Phoenix to take over former housing units for their operations , since there was no community centre to base activities like employment programs for youth, cooking classes for kids or tenant association meetings. 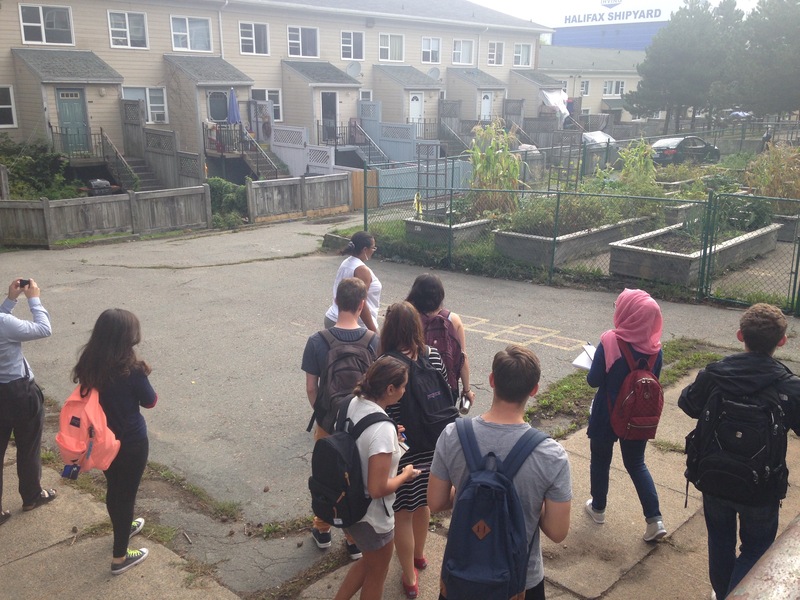 Our class spent a couple of weeks learning about the history of Mulgrave Park, including the working class Richmond community established in the late 1800s that was destroyed by the 1917 Halifax explosion. After lying vacant during the interwar era and hosting temporary Wartime Housing for military personnel during the Second World War, the decision to use the land for public housing was facilitated in the 1950s by amendments to the National Housing Act allowing the provincial and federal governments to collaborate on building public housing, and to build new commercial development in central neighbourhoods provided that new housing was built for the displaced residents. 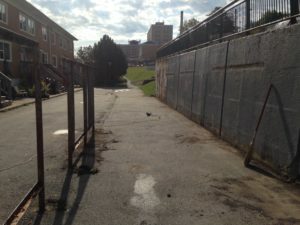 The City of Halifax had previously expressed interest in slum clearance of valuable central neighbourhood lands in the Depression and wartime years, but it was Gordon Stephenson’s 1957 report that sealed the deal. 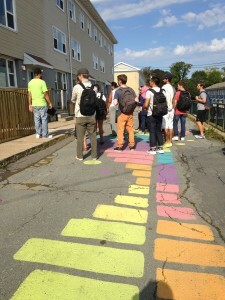 We visited the site on September 21st, with a walking tour by Crystal and Maurice, who answered many of the students questions about issues such as: what spaces in the community are used by children, youth, and the entire community; private versus public space; landscape elements; and maintenance issues. We’ll be visiting again at night to see things like lighting, pedestrian safety and other issues in the neighbourhood. Students will be presenting a historical analysis next week, and then will decide on a design approach for the social and open spaces in the neighbourhood. By the end of October they will each have focused on a particular design or programming element that reinforces the overall design approach. Then they will develop a report that evaluates and prioritizes the different elements, which we will present to the community.